Washington, DC— District Alliance for Safe Housing (DASH) Executive Director Peg Hacskaylo was recently selected as a member of Leadership Greater Washington’s (LGW) 24th Class. Leadership Greater Washington’s mission is to connect and challenge diverse regional leaders for the purpose of improving the quality of life in the Greater Washington area. Ms. Hacskaylo shares the distinction of LGW Class of 2010 membership with fifty-six other leaders who collectively represent our region’s diversity in its many facets. “I am honored to be a part of Leadership Greater Washington, and I look forward to making connections that will help me—and help DASH—to be a stronger leader and agent for change in the District,” said Hacskaylo. The 2010 Leadership class members will begin their journey in September 2009. Established in 1986, Leadership Greater Washington was constructed by a group of regional leaders, six area Chambers of Commerce and three committed organizations: The Greater Washington Board of Trade, The Eugene and Agnes E. Meyer Foundation and The Junior League. Modeling Leadership Greater Washington after other community leadership organizations, its founders invested personal and professional resources to fulfill their vision of an organization that would foster communication and cooperation among the area’s established and emerging leaders. Leadership Greater Washington offers dynamic, education and membership programs that promote dialogue and cooperation, enabling area leaders to find effective solutions to regional challenges. More information about the organization is available at www.lgwdc.org. Founded in 2006, DASH provides safe housing, housing resources and information, as well as training and technical assistance to community agencies and victim service programs to increase the availability of safe, affordable housing options for women and their families. DASH serves dozens of local organizations and assists more than 1,000 local residents annually. For more information, visit www.dashdc.org. Washington, DC— District Alliance for Safe Housing (DASH) is proud to be a first-time beneficiary organization in Fannie Mae’s Help the Homeless Program. This year DASH marked three years of service, and became an eligible applicant for the 2009 Fannie Mae Help the Homeless Walkathon. Fannie Mae created the Help the Homeless Program in 1988 to respond to the growing needs of homeless people in the Washington, DC metropolitan area. The Help the Homeless Program culminates every year on the Saturday before Thanksgiving at the Help the Homeless Walkathon. Over the past 20 years, the Help the Homeless Program has become the largest funding collaborative in the nation focused on homelessness, and has raised more than $69.5 million for nonprofit organizations in metropolitan Washington, DC that serve homeless people and those at risk of becoming homeless. Washington, DC—DASH was honored to host OVW Acting Director Catherine Pierce on a recent visit to tour our programs and meet with our staff. 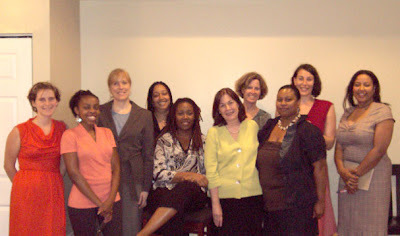 OVW Acting Director Catherine Pierce (front, 2nd from right) pictured with DASH staff and OVW staff Alice Braithwaite (2nd from left) and Anna Martinez (rear, 3rd from right). (Washington, DC) – The DC Department of Housing and Community Development (DHCD) today announced word from the Treasury Department that the District of Columbia will receive $33.7 million in American Recovery and Reinvestment Act (ARRA) funding to spur the continued development of affordable housing units. Under Section 1602 of the American Recovery and Reinvestment Tax Act of 2009, housing credit agencies, such as the District’s Department of Housing and Community Development (DHCD), are eligible to receive grants in lieu of low‐income housing credits under section 42 of the Internal Revenue Code (the Code) for 2009. In doing so, the District is electing to take a portion of its 2009 housing credit ceiling in the form of grant amounts, and agreeing to the terms and conditions applicable to the Section 1602 program. In an effort to create and preserve opportunities for affordable housing and economic development in the District, DHCD said it will direct the Section 1602 grant funds to finance construction or acquisition and rehabilitation of qualified low‐income building for low‐income housing in lieu of low‐income housing tax credits. DHCD issued a Notice of Funding Availability (NOFA) in April for projects focused on elderly housing; special needs housing; housing for chronically homeless individuals and families in mixed‐income buildings with supportive services; preservation of housing affected by expiring federal subsidies; new/substantial rehabilitation of housing; and new construction and preservation of affordable housing units. The application deadline was June 1. Washington, DC—The District Alliance for Safe Housing (DASH) today joined Mayor Adrian M. Fenty at the Lighthouse Center for Healing at a ceremony that marked notable achievements in the city’s commitment to house the homeless. The occasion spotlights remarkable growth in domestic violence safe housing in the District. With the recent opening of its Huruma Place housing program, DASH doubled the number of domestic violence “emergency beds” in the District from 48 to 96. In June, when DASH opens Huruma Place II, that number will reach 136. The rapid growth in domestic violence emergency safe housing is a direct result of Mayor Fenty’s ongoing commitment to ensuring that the District prioritizes housing for domestic violence survivors and their children. Washington, DC—DASH was recognized by the U.S. Department of Justice during 2009 National Crime Victims Rights Week. The organization was presented with a “Justice for Victims of Crime Award” for its work to shelter and support domestic violence survivors. “DASH is honored to receive the ‘Justice for Victims of Crime Award’ in recognition of our work,” said DASH Executive Director Peg Hacskaylo. The Award, presented annually at the Crime Victims Rights Week Ceremony, lauds outstanding dedication to the cause of justice on behalf of victims of crime and their families.